NOTE: Make sure to reset your keybinds to default again after installing the new build, otherwise the new semicolon key combos will not work! Uploaded to our forum for everyone to play with. Please keep in mind that this is an alpha release so features may be missing or buggy. It’s still stable enough that I think everyone will dig playing with it early. I was able to successfully output data to the HUD like player position and internal gametime as part of our SRTT Sandbox+ project. This project will allow the player to teleport to different locations, listen to the radio on foot, toggle superpowers, swap zones in and out and a lot more. For more info you can check out the new WIP thread for it on our forums. Just a quick update that I was able to create a brand new day/night cycle for SRTT that changes based on the internal game time. The changes are currently a bit abrupt so I’m also going to work on creating transitions so that it cycles smoothly. SRTT Save Editor is out! Corrodias has just released v1! The editor will allow you to toggle player upgrades on and off, set weapon levels, change respect and cash, activate any unlock in the game including alternate mission choices, toggle territories back to gang control which allows them to spawn again, edit your garage and arrange cars up and down the list, and more! I’ve had the pleasure of helping him test out early builds this past week, and it is a seriously awesome app that everyone needs in their Saints toolbox! NOTE: Like all SRTT modding, this app is only for the PC version of the game and not consoles. I have to wonder if perhaps Rubin took all the outpouring of fan outrage to heart over his perceived slams of the series. I guess we’ll all find out next year. Of course, that all depends if THQ actually makes it that long before wheezing a shuddering death gasp. Work on the new gui version of GoS is progressing steadily with most of the interface category tabs done. The two big ones that remain are weapon mods and tweak_table ones. After that, it’s simply a matter of writing the underlying code to build everything. The coding itself is going to be the easy part since it’s very similar to how the current batch menu version of GoS works. One of the neat new features of GoS is the ability to save a config file of your currently selected mods and then load that config at a later date. This will makes things much simpler for modded coop since you can email a buddy your small config file with all your selected mods and he can build his patch with those settings. It will also come in handy if you want to save multiple different modded configs and easily switch between them. 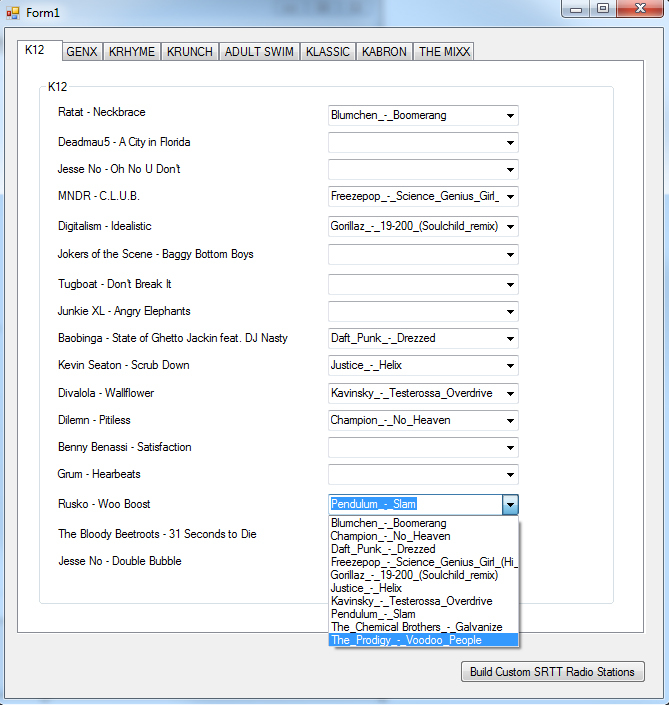 As many of you already know from my twitter, Minimaul and I are also working on an automated music conversion tool for SRTT that will allow you browse out to your personal tunes and select tracks to replace the vanilla radio station songs. With this new app, all the conversion and normalization will happen automatically behind the scenes and build your radio archives for you so you don’t have to mess with wwise or making sure your tracks are the correct volume. NOTE: While you can already do custom music with the guide from Toad King, the process is manually intensive and extremely slow going. It took me something like 2 months of off and on work to replace all 8 stations. You are currently browsing the idolninja.com blog archives for June, 2012.